Dexmet has taken “Expanding Technology” to the next generation of advancements, our MicroGrid® micro-mesh precision expanded material is infinitely variable, produced with smaller holes than anyone else and is thinner than any expanded material in the marketplace. Our proprietary expansion process produces a high quality expanded product with consistent open area, hole size and conductivity. Dexmet expanded materials are perfect for advanced batteries, hydrogen generation and fuel cell applications. 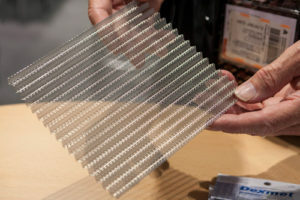 This is especially important when you are using multi stacks of materials and you need consistent conductivity from stack to stack also the expansion process is more cost effective unlike perforated material. The expansion process allows you to yield higher amounts of material than what you put in; it is highly cost-effective when your application requires expensive materials like platinum, niobium, zirconium and titanium. For more information visit Dexmet at Booth B1847 at The Battery Show in Novi, Michigan at the Suburban Collection Showplace. Literature and samples will be available at the booth. Steve Tucker, Product Sales Manager for the Power Technologies Division will also be available for consultation at The Battery Show. You can reach, Steve Tucker by e-mail at s.tucker@dexmet.com.